We are going on only our second cruise May of 2020. We stop in Nassau and the only other stop is Great stirrup Caye. This cruise we are taking our 11 and 15 yr old daughters. Is there anywhere to zip line? We tried to eat there beginning on January and it was pretty Smokey. My husband is sensitive to smoke, and it was to much for him. We stood at the check in area reading the menu, but passed on eating there. We bought the 6 pk before we boarded. I think it was 14.95. I didn’t mind the price and they were a good size. We kept them in our fridge in our room. The buffet area has a water area, though it does say do not fill water bottles. We did not fill the water bottles back up. We would take one into port or drink in the room at night. We brought a reusable cu to use to drink water on the ship in the pool areas. We would fill that up at the Buffett. We had almost the same exact experience on this same exact cruise at the beginning of the month! We are now eyeing a 4 day cruise on the breakaway next year. Welcome aboard show was in the theatre. First come for seats. We showed up about 40 min before show and got great seats. I believe the show times were 7:30 and 9:30. No music in H20. The screen showed pictures of tropical places. Only at night at the partys were the music and screens working. I agree, wish music played there. Forgot to mention... The getaway does have paper straws for the frozen drinks only. We did take our own plastic straws and used them, the paper ones are only good for 15 min or so before they become soggy. LEAVING THE SHIP... I set my alarm for 6, cause I wanted to watch us pull into port of Miami. I also ordered room service coffee and fruit so I could enjoy it one last time on my balcony. If you've never watched them parallel park huge ships...you must. What a sight! We were doing self assist walk off, so around 7:45 we headed down to the casino. Now, some people will think it was chaos and unorganized, but if you followed what the staff told you it went pretty fast. Stop yelling at these poor people! They want you off the boat as much as you want off. It took about 20 min to get off the ship. Customs was a breeze, 5 min maybe. Then a Lyft ride to Fll and here we have sat all afternoon. Some other things I want to mention.... While our room steward was a very nice young man, we hardly saw or spoke to him. I had higher expectations, I dont know why. The staff for the most part were all very friendly. Some looked stressed or wore put, but as a whole the staff was amazing. The cruise director was Paquito. He was alot of fun! All the entertainment staff were! Food overall was good! We had a 3 specialty dining pkg, but the food in taste and savor are delicious, so unless it was a free perk, I wouldnt buy it. The ship is so big we did not get to alot of stuff. Never got to do the water slides or ropes course. Didnt watch much in the atrium. Missed the dueling pianos. Guess we'll just have to go again! LAST DAY AT SEA...Boo.. We are from the Detrout area and we are not ready to be back in the cold. Though I am missing my kids, bed and pets by this point. We ordered room service again and took our time getting up. We ended up in spice H2o for awhile. It was warm and sunny but the wind was crazy! We went back to the room, hung out on our balcony..then explored the ship one last time. Dinner tonight was at Cagneys. I was looking forward to this all week! For an appetizer we had crab cake and shrimp cocktail. Then I had cesar salad and hubby had lettuce wedge. Again, both great! I ordered a steak, but I'm drawing a blank on which one...but it was hands down best steak I ever had. My sides were mack and cheese and truffle fries. They were both so so. The mac and cheese was so greasy. I was not a fan of the truffle fries, but that isn't their fault. Hubby had the shrimp skewers and same sides as me. He didnt love the fries either. Dessert he had cheesecake and I had an apple pie type thing. Both were good. When we sat down to eat the waiter made sure yo tell us more then once we only get one thing from each section. We had not planned to order multiples, we couldn't eat that much! But I did think it was slightly rude he kept bringing it up. Also they sat everyone very close to each other. No private conversations here! We got there right when they opened, so it wasnt like they didn't have open tables. After dinner we went back to start packing snd then to the farewell show, which was great!! Bed kinda early, cause we are doing self assist in the morning. DAY...I've lost track..lol..today's stop is cozumel Mexico and I'm tired! So. Much. Walking. We headed to buffet for a light breakfast, then off the ship to explore cozumel. No plans here really. We walked around the shops. Got shirts for every person in our family since they are 100 for $20..j/k kinda..lol. We decided to get a cab to Paradise beach. Cab was $17 one way for two people. To get into paradise beach it is $3 OP, then they ask you to spend $10 pp on food or drink. We spent $40. They have alot if beach chairs. Some by the ocean, some by a huge pool. We started by the ocean. But the sun wasnt on that side, so we moved to the pool, which we really enjoyed. Stayed a couple hours then take back to ship was $25-go figure. We were docked next to a holland america ship. Back on the ship it was time for a shower and a nap. So much sun and drinks this week it's starting to catch up with us. Since I cant remember if last night was taste..or if it was this day...one night we went to osheshans. We headed to bed pretty early. I think the click read 9pm..lol..
DAY 5-Costa Maya, Mexico This day we ordered the continental breakfast delivered to the room. At this point we are getting tired of eating...so. much. Food. Today we had reservations at Maya Chan, a private beach that included all you can eat and drink. The also provided transportation to and from. To get to the maya chan meeting location you have to walk...and walk..then walk some more. Then you will think you went the wrong way, but nope..just have to walk more. I actually almost had a meltdown cause it felt like we were walking in circles. Finally find the check in point. After a bit, they put you in a taxi and it's about a half hour ride. The roads are horrible..lol..but it's a dirt beach ride, so what do you expect. I had researched this place a ton. They have excellent reviews all over the web. Their beach is not crystal clear. They also have a seaweed problem, but the views are amazing. I was 100% ok with that. I'm all about putting my but in a chair, getting some sun and relaxing. They give you your own space, bring you drinks and chips and salsa right away. I loved it. My husband was bummed with the water, even though I had explained before hand how it would be. The food was good and do were the drinks. I'd come back in a heartbeat, not sure about my hubby. After lunch they come around snd ask what time you want to head back. We went a but early so we could look at the shops. Back on board we went back to the room to shower and change. This night we had reservations at Taste and I think this is the night we seen million dollar quartet. (The days are blending together..lol) We liked taste. I had the NY strip. It was cooked well and I loved the sauce. I also had the cesar salad, which hands down was the best salad I'd ever had. Wish I would have tried it earlier in the week. I also had the coconut shrimp as an app. It was ok. Nothing to amazing. For dessert I think I had the lemon cake, it was delicious! We headed over to theater to get in line for the show. We were early enough to snag great seats again. What a fantastic show!! So good. We are still talking about it. I would of seen it again! DAY 4- harvest caye Breakfast was again at the buffet and then we went back to the room for a bit. Today was a rainy cool day. We had no plans for anything on harvest caye. Once the rain let up, we did get off the ship and walk around. Nothing here really impressed us. The beach hurts your feet. It is not sand, its crushed shells. The pool looked nice, but we didnt feel like going in. We bought a souvenir and headed back on the ship. We did finally get to enjoy the hot tub since lots of people were off the ship. Lunch was at Margaritaville. It is not complimentary. It is $15 pp plus 20 % gratuity. I really wanted to try it though and we had some Obc to use. For an appetizer we had the nachos and conch fritters. Both were excellent. We each had a burger as well...we were not to impressed. Nothing to write home about. We could have gotten dessert too, but we were stuffed. Back to Spice H20 for the afternoon just lounging. This night we had reservations for Mederno. (Spelling ?) We have a Brazilian restuarant like this by us that we go to a couple times a year. The salad bar here is wonderful, but the meats were just ok. I prefer my meats to be med, and most of these were well done. Also there were not many options that were not red meat, which isn't my husbands favorite. The one by us does chicken, shrimp and pork. This one only has 1 chicken and 1 pork. We also were sat next to a loud and obnoxious family, who you could tell had taken advantage of the UBP. I dont believe we had dessert here..if we did it must not of been memorable..lol. afterwards we seen one of the comedy shows. It was ok. Not our favorite entertainment we seen. Bed came early for us. All the walking and getting up early started to take a toll on us. **sidenote** There were these pelicans that would size in the water at full speed to catch fish. It is hilarious. We watched them from the ship for hours! DAY 3-ROATAN: We had a private tour with Ronys booked here. I will say that walking through the gauntlet of people screaming at you to book their excursions or buy their stuff was horrible. We had never experienced anything like it. It took everything in me to not high tail it to the ship and not get off. It was our first out of country experience. And I was better prepared for it at all the other stops. I cant remember our drivers name but he was a younger guy. Very nice. Answered any questions we had about life on the island. First we stopped to see the sloths and monkeys at Daniel johnsons. This was my favorite thing of all the stops. Definitely was a bucket list item for me. We then headed to bananrama, but they were sold out of chairs. A guy was offering a boat ride to snorkel for $25 pp, so we did it. Took us on a 20 min boat ride. Seen some neat fish, but here the coral is all dead. After we got back from snorkeling, we headed back to the port to shop and get back on the ship. It was $80 for the private driver and I can't imagine going around the island with out one. They are crazy drivers. For dinner we ate in the Tropicana. This was the only meal I hated on the ship. For an appetizer i had the bruschetta, which the "toast" was hard as a rock. Then had the potato cheddar soup. That was pretty good. Then had the baked ziti, which was like warm and had no real flavor. I didnt even eat half. Dessert was tres lache cake which was decent. We didnt eat at the Tropicana again. We had reservations for burn the floor. We arrived early enough that we got great seats. It was an amazing show. Those dancers work hard. After that, per almost every night, a walk around the waterfront and a drink. Our first night we decided to just do the buffet. We had hung out at the pool for awhile, did some exploring and wanted to catch the Welcome aboard show. We dont mind buffets. I know they are not most peoples thing, but we thought it was fine. The pretzel rolls with chicken salad became a fast favorite of mine. I will say he hit the buffet on Asian night and that was bad. We didnt care for most of it so we ended up at osheshans that night for dinner part 2. We loved the welcome aboard show...and actually all the shows we seen were amazing. After the welcome aboard show we went and walked all the outside decks with a stop at the sugarcane mojito bar. Which became a nightly thing for us. DAY 2: Our first sea day. We started off with breakfast at the buffet, which besides a couple continental breakfasts delivered to our room is where we ate breakfast every day. Their French toast with banana sauce is amazing. My hubby loved the made to order omelets and the round hashbrowns pucks. I also really loved the muesli (I think I'm spelling it wrong) that with a plate of fruit became a daily thing for me. We then went in search of a lounge chair for the day, which was impossible almost every day. We didnt care where the chair was located, just wanted 2 in the sun. The chair hogs are a real thing and I cant evem imagine what time they have to get up to stake their claim, since we were up pretty early everyday. This day we did find a couple in Spice h20. I really liked that part of the ship, it's also like 20 steps away from the margaritaville, which we had margaritas from there multiple times a day. No wait either! This day we had reservations for Teppinayki. We had the 3 special dining pkg. We had never been to a Japanese restaurant like that. For the most part we enjoyed the food and show. Dont think I'd pay out of pocket for it though. Did a bit more exploring and then headed to bed. It seems like this whole trip we couldn't stay up past 11pm..lol. Our cabin: We were booked in a balcony cabin. 13852 was our cabin. I've read people say how small the cabins, bathrooms and balconies are, but we thought they were just fine. All of our clothes fit in the closet, our luggage under the bed. We had a hanging bathroom organizer, but there were plenty of shelves in the bathroom. The balcony had two chairs and a small table. We sat out here alot this week and never thought it was to small. I loved the balcony. I loved getting up early and sitting out there. The ship is noisy, so when it became to much, we headed out there with a snack and a drink and just listened to the waves. I'm not sure I could sail with out one now. Also, our bed was near the balcony. I loved this set up. Sl once ypu showered you could come out near the couch to get ready. This worked well. I would sit at the desk area and do my make up on the nights we got dressed up while the hubby showered and then got dressed. Here are a few pics. Excuse the messy room. I realized this morning I had never taken pics of the cabin. 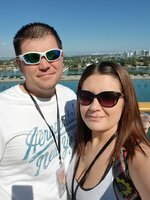 **Tip** So since this was our first cruise, we had no idea about this, so I'll share. The first two night we sweated to death at night. It seemed like the air would only run for an hour or so. We talked to guest service and DO NOT PRESS THE SNOW FLAKE BUTTON. Just press the button that makes it go cooler. We slept much better after we learned that!